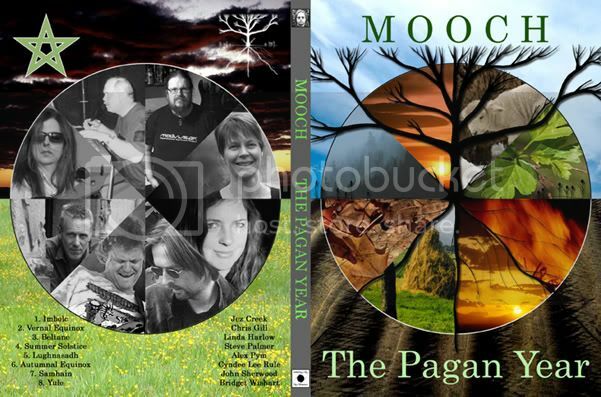 - the Mooch main-man Steve Palmer and AmbientLive Records release a new space-prog epic, The Pagan Year. And as before there are some stellar guests: Bridget Wishart (Hawkwind), Alex Pym (Dream Machine), Chris Gill (Band Of Rain), Cyndee Lee Rule, Jez Creek, John Sherwood and Linda Harlow. Erich Z. Schlagzeug is the drummer. Welcome to a space-progressive rock album for a new pagan future. I’ve been interested in paganism for many years, and was, until I moved away from the Westcountry, a long-time member of the Pagan Federation. A pagan is a follower of a polytheistic or pantheistic nature-worshipping religion. Before any human-centric religions developed, there were many other spiritual traditions in each country - for example, Druids in Celtic countries, Shamans in many countries including Native America and Siberia, Shinto in Japan, Witchcraft and Wicca, Norse Tradition and many other traditions. The Pagan Federation from its beginning in 1971 campaigned to have Paganism recognised as a valid path, and for the rights of Pagans to hold and practise their beliefs openly without fear of retribution or condemnation from those who viewed these beliefs as being evil or otherwise. The Pagan Federation has been successful in this area - Paganism is now officially recognised. The Pagan Federation continues to work both alone and with other Pagan Organizations in promoting awareness of Paganism to individual Government departments, the general public and individual enquirers. The Pagan Federation supports any Pagan, irrespective of whether they are a member or not, in times of need - this may include providing factual information in cases such as child custody disputes, supporting those suffering from harassment for being a Pagan and even providing expert witnesses or legal advice if necessary. The Pagan Federation continues to campaign or support campaigns in many areas that are of concern or interest to the majority of Pagans such as environmental issues and human rights. Imbolc is one of the four principal festivals of the Celtic calendar, celebrated among Gaelic peoples and some other Celtic cultures. Most commonly it is celebrated on February 1 (or February 12, according to the Old Calendar), which falls midway between the Winter Solstice and the Spring Equinox in the northern hemisphere. Perhaps originally dedicated to the goddess Brigid, in the Christian period it was adopted as St Brigid's Day. In Scotland the festival is also known as Là Fhèill Brìghde, in Ireland as Lá Fhéile Bríde, and in Wales as Gŵyl y Canhwyllau. Fire and purification are an important aspect of this festival. Brigid (also known as Brighid, Bríde, Brigit, Brìd) is the Gaelic goddess of poetry, healing and smithcraft. As both goddess and saint she is also associated with holy wells, sacred flames, and healing. The lighting of candles and fires represents the return of warmth and the increasing power of the Sun over the coming months. Bridget Wishart (Hawkwind, and much more...) Bridget sings on Beltane, the third track on the 'Oak' disk, and also plays EWI and saxophone. Alex Pym (Dream Machine, Pyramids On Mars, and much more...) Alex plays two smokin' guitar solos on Lughnasadh, the first track on the 'Holly' disk. My kind of music. I spend a lot of time listening to Radio Praetoria on the internet. And your music definitely fits in with my preferences. I hope to post some reviews soon.